Carroll & Graf, 9780786713783, 528pp. Through the last three presidential administrations and two wars with Iraq, no one has personally witnessed, influenced, or fueled news over more history-making events than Joseph Wilson. 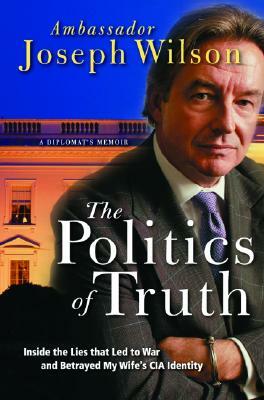 The last American diplomat to sit face-to-face with Saddam Hussein, he is a consummate insider who has the intelligence, principles, and independence to examine current American foreign policy and the inner workings of government and to form a candid assessment of the United States’ involvement in the world. In February 2002, Joseph Wilson was sent to Niger by the CIA to investigate claims that Iraq had sought to purchase uranium in that country. Wilson’s report, and two from other American officials, conclusively negated such rumors, yet all were brushed aside by the White House. Startled by the infamous words uttered by George W. Bush in his 2003 State of the Union Address: “The British Government has learned that Saddam Hussein recently sought significant quantities of uranium from Africa,” Wilson decided to reveal the truth behind the initiation of the Iraq war. The Politics of Truth is an explosive and revelatory book by a man who stands for the accurate recording of history against those forces bent on fabricating truth.